In the last decade the popularity of prescription narcotics has skyrocketed. Doctors are writing more prescriptions for painkillers and other controlled substances than ever before, and the pharmaceutical companies and the pharmacies themselves are cashing in. Most people who take these type of drugs are doing so under the legal care of a physician, but a large illegal market for pills has developed. In the 90’s it was almost unheard of to illegally buy and sell pharmaceutical drugs on the street. There just was not a demand due to the availability of cheap heroin, cocaine, and other drugs. At some point in the last ten years an enormous demand began to develop for painkillers such as oxycodone, morphine, and anti anxiety medication such as Xanax. For a variety of reasons heroin became more expensive and risky, and dealers and users found a cheaper and easier alternative in painkillers. Not surprisingly, prescription fraud arrests have increased statewide and around the country. Here in Maryland, this crime is officially called false prescription, and is felony punishable by up to five years in jail. Prescription narcotics were easier to obtain because distribution remained largely unchecked by law enforcement for years. In addition, the state medical board lacked the will or authority to accurately track and monitor the amount of pills that were being bought and sold. The narcotics became cheaper as a result of many of the most popular drugs going generic. The combination of easy and cheap produced the current trend, but now law enforcement is catching on. Cops are much more aware of the ways which people try to obtain narcotics without being under the good faith care of a physician. Doctor shopping has always been a crime, but now a main area of focus for state and local law enforcement. Cops are also on high alert about the popularity of fraudulent prescriptions. It is common now for police detectives to visit pharmacies around the state to educate employees about the signs of a false prescription. The tell tale signs of a fake script are now common knowledge, and it is no longer a secret that the phone numbers on the actual paper may be linked to a cell phone of someone impersonating a doctor. Pharmacists who once didn’t think twice about filling a narcotic script are now scrutinizing each and every one. Some pharmacies may still fill just about any prescription, but most are beginning to turn customers away at any sign of fraud. Others are now taking the next step and confiscate the actual paper script and call the police. Doctors are also becoming more cautious and cooperative with police. Keep in mind that under Maryland law, the medical information that is given to a doctor in the course of obtaining a false prescription is not privileged, and will forwarded to police. Cops cops will typically follow up on any fraud investigation involving pills and the state’s attorney treats these cases seriously. Depending on the jurisdiction, even a first time offender could be facing significant jail time for this crime. 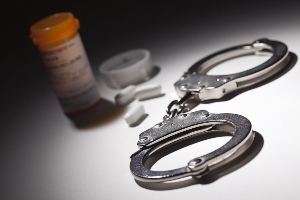 If you or someone you know has been arrested for possessing or using a false prescription, contact The Herbst Firm for a free case consultation. Our drug crime lawyers have experience in fraud cases and doctor shopping, and are ready to take on the police and the state.